I know I’ve complained before about the lack of growth/development of Chiaki as a character. It wasn’t until watching his interactions in these two episodes that I noticed that he did has shown some growth. At first, he was rather adamant about being apprenticed to the famous conductor Viera, whom Chiaki meet years before. At first, when he applied to Stresemann to change majors from piano to conducting, it seemed more like an opportunity to further his career goals. Now, in practicing Rachmaninoff with Stresemann, he’s learning not only to be able to play the piece technically, but to play the piece with his emotions as well, to let go of his need for control and to lose himself within the music. It’s interesting to see that this is the part he has trouble learning. All he thinks of is that he has to sway instead of just feel the music (where Yoda when you need him). The times I’ve had to just let go of my “control” were a little tough and I’d imagine that Chiaki would/does feel the same. Chiaki’s need for control becomes evident (at least to me) when he watches S Orchestra’s performance of Gershwin. From the start, he’s analyzing the performance, wondering why melodicas are included in the performance. eventually he he admires the technical aspect of incorporating them into the piece. 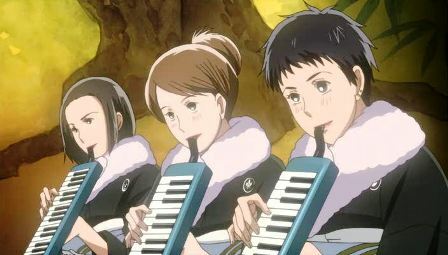 You know, you just know that Chiaki would never let a melodica any where near a stage. Taken as a whole, this episode was enjoyable. S Orchestra’s performance of Gershwin was just fun. 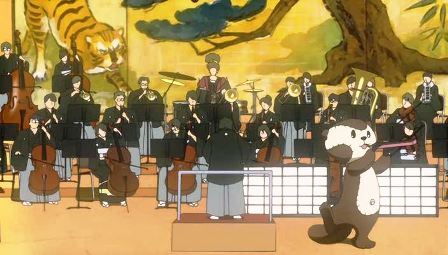 If the animators were to animate only one orchestra performance, this would have been the one to do. 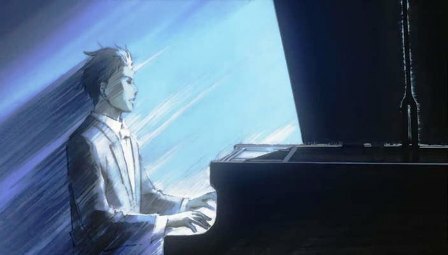 Watching this episode as a lesson for Chiaki, it isn’t until S Orchestra’s performance that he understands that performing a piece like Rachmaninoff’s piano concerto doesn’t mean swaying, its means giving himself over to the passion that each note creates. Whenever I see someone enjoying what they play, it makes their performance much more enjoyable. 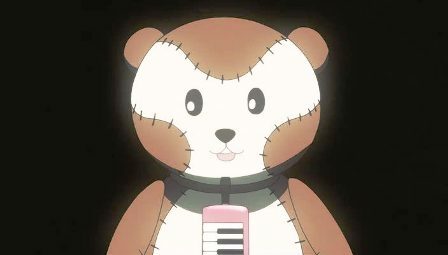 While I think that the S orchestra’s Gershwin’s performance wold have been a great one to animate, I’m glad that they didn’t completely animate Chiaki’s Rachmaninoff’s performance in episode 11. I think it worked well with still images for the most part and animating Chiaki only in a few places. 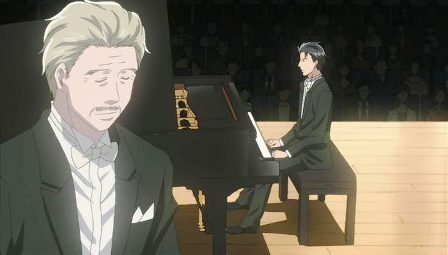 I am surprised, however, that they animated pretty much the whole, if not the entire, Piano Concerto No. 2. Even for an animated show taking place at a music conservatory, I wouldn’t have expected such a long piece (nearly 10 minutes) to have been animated. But I’m glad they did as it worked well. Chiaki’s regrets near the end just made that performance somewhat bittersweet. 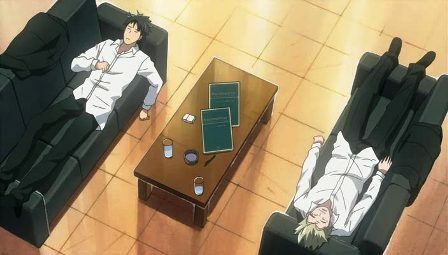 It is somewhat funny to see that the cold Chiaki actually expresses concern for Stresemann’s health - wanting Stresemann to stop drinking and smoking. I can only attribute that to growth in Chiaki. While he has been steadfast in his belief that only Viera can be his teacher, sometimes the lessons we learn come from teachers we least expect. The whole Rachmaninoff performance was indeed something great. I am glad they didn’t put too much emphasis on the animation for that sequence as the use of still images also reflects the mood of the piece being played. 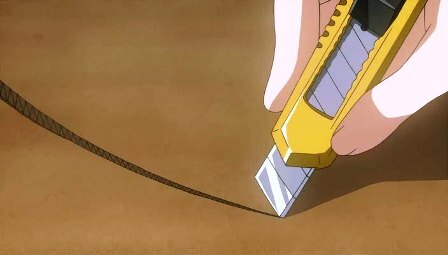 Though with it being an anime based on classical music performances, I don’t think animation would blend in well as you would get distracted from the music itself. It was a great piece to watch. You’re right, it did evoke the right mood. I do think the S-oke Gershwin piece would’ve been a good one to animate. Probably a complicated one, but a good one.